Last Friday was International Women’s Day. Most women in the world were waiting for a gift or the best wishes as it is the way it is celebrated in most western world. But Italian women received a very peculiar message when they saw Fiat’s gift for them. 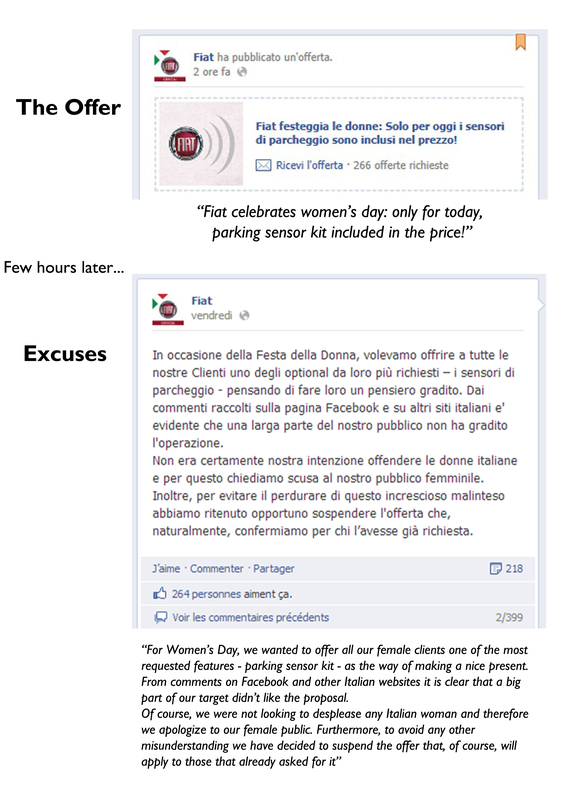 On Friday Fiat Italy decided to celebrate women’s day by offering them parking sensor kit included in final price in all Fiat models. It may had been a nice idea, but the fact of putting those two things together, became a big image problem for the company. Actually when I first heard about it I thought it was a joke but then I realized it was an official message in all social networks. I must recognize that I laughed at the beginning, but then I saw how a bad message can ruin the image of a company. Fiat is the absolute leader in Italy, but its image has been severely affected in the last 10 years. Italians don’t see Fiat as the leading car maker anymore. Lot of them moved to other brands, and their opinion about Fiat is not the best. I say this based on my conversations with Italians (in Turin), on what I read in automotive forums, and so on. That’s why Fiat guys should work harder to get the trust back, and what they did on friday isn’t certainly part of that. Wouldn’t it have had more impact in terms of brand image, to place some people wearing Fiat stamped clothes in the streets and give flowers to women? yes, it doesn’t boost sales, but it can help the brand to better position its image among Italians. Anyway, the idea wasn’t bad, but the way they communicated it was terrible. 2 hours after the offer was published, there were 266 purchases. However, some hours later they had to apologize for the misunderstanding and there were 399 comments in Facebook. If Fiat wanted to generate controversy, they certainly did, but at the end there were more bad than good things. Italian people should be less serious. It was funny, not disrespectful! Unfortunately this is a further sign of an old-fashioned view of women at Fiat. When a Swedish journalist questioned why fiat / alfa stands were full with young women whose sole purpose at the booth is to look good and be photographed by men who zooms in on their … Sergios’s response was in the same spirit as expected from a country with bunga bunga parties. Do not misunderstand me, I like beautiful ladies, but when young women are exploited like this, it feels old-fashioned and completely out of sync with the times. I know that my post will get a lot of comments with the opposite view. Maybe it’s just 5% of Fiat’s customers that react the way I do, but why alienate them? If Fiat is likely to get a reputation, especially in North America and northern Europe, for being a male chauvinist brand why continue? 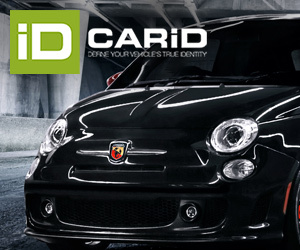 Is Fiat not concerned about their brand? Haha, it just had to be a Swedish journalist asking that question. Sweden, as we know, is the land of hyper-feminism, hyper-political correctness and pathological envy. Let’s try not to follow the Swedes in their race to the bottom.